Zune + Windows Mobile. Interested? Microsoft has always been a proponent of separating hardware and software. Even his highness, Steve Ballmer, recently advised Apple to separate the iPhone’s hardware and software for it to succeed after 5 years. This coming from the same man who was praising Apple’s software + hardware ecosystem in his memo to his employees. Now, before agreeing to Ballmer, we have to realize that the hardware and software in cell phones is always tightly bonded. How Ballmer proposes Apple to separate them is beyond me. You can’t get Windows Mobile from a store and install it on any cell phone you want. Same goes for the iPhone OS, Symbian, Palm, Android and others. And as we all know, Apple exists due to its eco system. This is the same eco system that inspired Microsoft to develop Zune with the Zune Marketplace and desktop software. Even the Xbox 360 is like iPods, iPhones and the Zune. These are systems in which you can’t separate the hardware from the software and vive versa. The theory of ‘Windows on any PC’ just doesn’t work with these devices and never will. Anyhow back to the topic, Ballmer has announced that it’ll be integrating Zune services in Windows Mobile, under the codename Pink as said by Mary Jo Foley. The last time I checked Windows Mobile 7 has been delayed. Windows Mobile is mainly aimed at the enterprise market, and lets face it. It’s not that user friendly. It can’t match a Nokia, iPod, Samsung or a Sony Ericsson device. I bet my many non-computer science friends would be confused with the navigation in Windows Mobile devices. Integrating the Zune experience in such an OS seems a bit absurd to me. 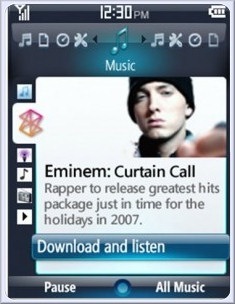 The Zune + Windows Mobile integration could arrive before Windows Mobile 7. Which means that unless you’re using an HTC device or the Sony Ericsson Experia, you’ll be stuck with the same OS experience. I’m not pointing out any flaws here, I’m poking at the user experience. 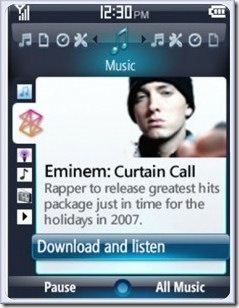 A music device is supposed to be great at usability. And sadly, unless you’re a geek, you wont find great ease of use around in the Windows Mobile world at the moment. I find Windows as a desktop OS, easier to use than any other OS. But for a cell phone, it gets somewhat complicated for most people. And of course not all people in the world are geeks like us. Pink is an odd codename, but whatever. this article isnt biased at all….